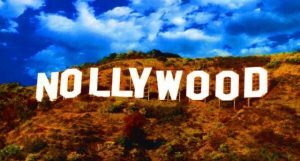 ◉ “Nollywood, the video-film industry from Nigeria, emerged on the scene in the early 1990s, when film industries around the world were going through major transformations of economy, production, and ideology. Since then, a spate of newspaper and magazine articles, photoessays, and documentaries have come out on this youngest film industry in world cinema, which express mostly curiosity about this film phenomenon defined by low budgets, spontaneous and improvised acting, poor production quality, and unfathomable production rates… Nollywood challenges the conception of world cinema as a totalitarian enterprise (Hollywood), as a selective mode (art house and film festivals), and as a contrarian model (a militant conception of Third Cinema)” (Deshpande and Mazaj 175). ◉ Nollywood refers to three broad industries, characterized by their ethnicities and language. Kannywood, of the Hausa culture in the north and based in the city of Kano, has its own industry developed in deep affiliation with Islam. ➞ It is distinct from the two industries in the south around Lagos: Yoruba (Yoruwood) and Igbo (Igbowood) video-films, which are both inflected by different traditions. Other emergent and smaller industries based on ethnicities and languages also belong to the industry: Edowood (Edo films), Urhhobowood (Urhobo films), and Wafiwood (Warri pidgin-English films)” (176).